These are Trick Flows original after market Heads—the ones that started the high performance small block Ford head revolution, one of the most dominant aftermarket heads in racing. Now their even better; updated with today's cutting edge technologies. Fully CNC machined combustion chambers for a better fuel burn rate. Thicker port walls, and a reshaped intake ports increase rigidity while improving flow. Interlocking ductile iron seats handle high horsepower and heat stress. Intake Port Dimensions: 1.200" x 2.000"
Minimum intake cross section: 1.8sq. In. Exhaust Port Dimensions: 1.250" x 1.500"
Minimum exhaust cross section: 1.5 Sq. in. 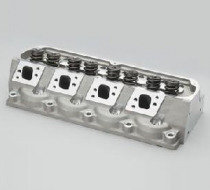 Valve Covers: OE bolt pattern,raised 0.400"